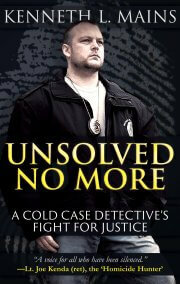 UNSOLVED NO MORE is now available! Order your copy today! 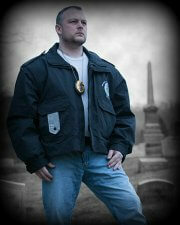 As a law enforcement officer for over fifteen years, Detective Kenneth L. Mains has investigated thousands of cases. Although he has been called “a modern day success story”, it wasn’t without failure. This book will take you on a journey from a struggling kid who barely graduated High School to a teenager who joined the Marine Corps and finally to a man who put himself through college in order to accomplish his lifelong goal of being a Detective. Mains has held a distinguished career in law enforcement which has included working undercover with the FBI, solving cold cases, investigating the Mafia and later leading one of the greatest cold case organization ever assembled. Because of his innate ability to solve cases, Mains is routinely sought out by law enforcement and victims’ families to help solve cold cases. He will take you through some of his very own cold case investigations to give the reader an insight on how he solves cases by using the art of deduction. Through triumph and tragedy you will see that he has succeeded by staying focused on his goals regardless of the obstacles placed in front of him. Yet, this is a story about success as much as it is a cold case instructional by someone who has been referred to as “One of this Country’s Greatest Detectives.” He will show you how he has succeeded in law enforcement but more importantly he will show you how he has succeeded where it matters most… in life. Cold Case. Just sounds chilling, doesn’t it? What is a cold case? There are many definitions, some more technical than others. The simplest definition is a case that does not have definitive resolution. That could be an unsolved homicide or it could be that someone is in jail and convicted, but there is serious doubt to the likelihood the person is actually responsible for the crime. Yes, there are innocent people convicted in America. Regardless of one’s definition, one thing is universal when it comes to cold cases, they are cold for a reason. They are cold because they are difficult. The offender was lucky, smart or a combination of both. They are cold because the offender kept his or her mouth shut and didn’t need to brag about the crime. They are cold because the leads dried up and the case got overrun by other cases. I can tell you that most detectives never forget an unsolved murder they investigated or were a part of in some way. The unsolved murder will stay with them long after retirement. They would like nothing better than to see the case solved. They would love to dust off their boots, pull out the old gun belt, get back in the fight and re-investigate the case. That is why cold cases never go away—someone will always care. When I work cold cases, I love to reach out to those original detectives. I speak to old detectives every single chance I get. Not only do they have a wealth of knowledge, they still have that fire to see the case solved. They can tell you things that are not in a report. They can tell you a movement or look a suspect gave during a specific question. Subtle things like that will often go unnoticed or at the very least not end up in a report. However, that veteran detective never forgot and h e wants nothing more than to share that information. You just have to be willing to go get it. 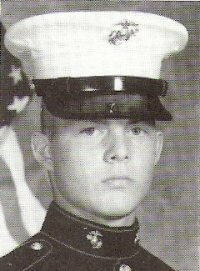 I had worked for the Williamsport Bureau of Police in Pennsylvania for about four years and never heard the name Dawn Miller or knew we had a cold case within our department. Little did I know this girl, whom I never met, and the cold case it embodied, would change my life forever. It was just a name that came up on my Google search when I was researching missing persons in my area. But there it was, staring at me as with a purpose. Dawn Miller. Missing. Cold case. What an incredible journey it has been since that day in 2007. My journey really began the very next day. It’s my job to solve the case. I can do that. I have the innate ability to do that. What happens after that… well that’s up to the system. At the end of the day you must be able to look at yourself in the mirror knowing you have pride, integrity and you gave it your all every single day. That is success. During my decade and then some of investigations, I have concluded one undeniable fact; you never know what people do behind closed doors! You can look a murderer in his face, shake his hand and never know that very hand was wrapped around the neck of a victim, choking the life from their very soul. Do you accept any help from mediums and those who channel information? I “read” photos and I recently put up a Facebook page to do this on the side but unless family requests (lots of sleuthers ask), then I’m not sure it will do much good to have this gift without a true result. I would like to know if you’d be open to me doing some readings on some of your cases if you are still active, to see if my readings could further your investigations. ? ?